May Day offer - organise, agitate, educate! If you look at the pamphlets below, I've reduced the price of everything, as a May Day offer to one and all. 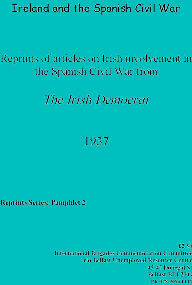 Available Publications - No Pasaran no longer available!! This pamphlet was written and printed in 2007, and is now out of print. The IBCC is looking at a further small publication this year - so keep checking here. 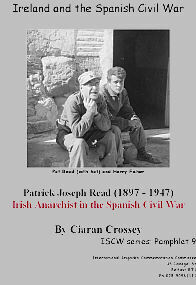 Pat Read - Irish Anarchist in SCW. While a lot of people credit Jack White as being an Irish anarchist in Spain, a rather dubious claim I think - there is no doubt at all about the political allegiances of Pat Read. This is, even if I say so myself, a fascinating read. 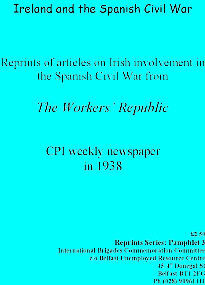 I checked the pamphlets and found that there were a number of articles missing from the Irish Worker and Irish Democrat collections - both now fixed. Anyone who bought an earlier edition should contact me and I'll sort things out. 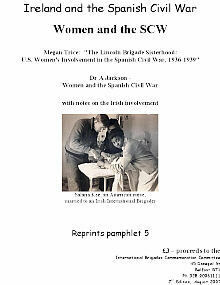 There have been some additions made to the Dan Lyttle pamphlet, extending it by several pages, and a similar change to the Women and SCW pamphlet- this now includes material on Salaria Kee, the black American nurse who married an Irish volunteer. I pulled together a collection of documents by Eugene Downing, along with an interview with him, see below. The original documents are amazingly detailed. 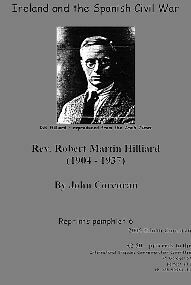 John Corcoran has written a long article on Bob Hilliard and agreed that it could be reproduced by the IBCC. Thanks. If you want the entire collection of pamphlets/booklets written/edited by Crossey, as a special offer you can buy all 9 of the items listed here for the bargain price of � (within Ireland/Britain). Anyone from further afield MUST contact me first to see how much the post would be. These pamphlets are sold to raise funds for this project, so we can't just pay all the income on post! European union/Ireland - don't blame me, blame the Post Office! - supply of the 9 pamphlets written/edited by Crossey [This excludes the Nalty item which is not available, and has no involvement from me! 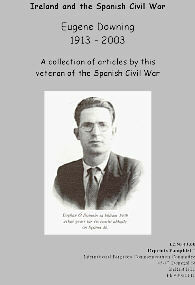 The first article on this Irish anarchist who fought in WW1, the Irish Civil War and the Spanish Civil War. He was active with the International Workers of the World, editing its newspaper, the Industrial Worker. Following the successful Lurgan Trades Council meeting on the local men in the SCW, I've written up 20,000 words, approx. 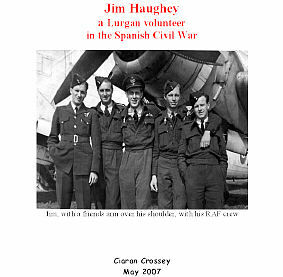 on the story of Jim Haughey. I've tried to sort out the details of his trip to Canada after the war, etc. This is a very useful compilation of articles, 30 pages pamphlet - gives interesting material on the initial response to the SCW and on labour history. This paper was a a joint production between the CPI and memebrs of the Socialist Party in Northern Ireland (an activist group within the NI Labour Party). This is a 56 page compilation of hard to obtain material. 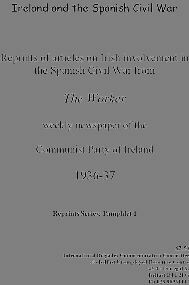 With the closure of the Irish Democrat in 1937, the CPI started a new, small paper. the Workers Republic carried a lot of reports on the closing stages of the war, an 18 page compilation. 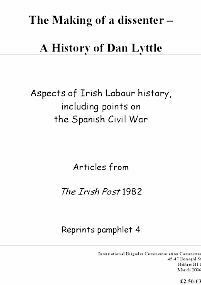 Memoirs of Dan Lyttle - he was a Belfast man, who left for Australia, joined the CP. Lots on interesting details on Liam Tumilson, the Out Door Relief riots, and the SCW. A 16 page compilation of articles from the 1980s. This recent document was written after the author got unprecedented access to Hilliard family papers. This 11 page report gives a lot of previously unknown details. A collection of a dozen articles, interviews and obituaries. A 30 page set of documents. Copies of all these publications can be bought here and now using PayPal. Or they can be obtained from Ciaran Crossey, IBCC, 45-47 Donegal St, Belfast BT1. Buying thru Paypal is easy. BUT, the postage I've priced above is for UK/Ireland - anyone wanting material posted to the rest of Europe, or further afield, should contact me first to get a price. Sorry about that. Ciaran Crossey, Updated May Day 2016. 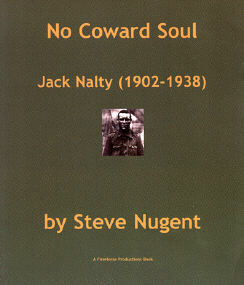 A biography of Jack Nalty, written by his nephew, Steve Nugent, 2003. An extract from this 90 page book can be read by clicking on the book cover.